GIA describes colour in terms of hue, tone and saturation. Hue refers to the diamond’s characteristic colour, tone refers to the colour’s relative lightness or darkness, and saturation refers the colour’s depth or strength. Using highly controlled viewing conditions and colour comparators, a colour grader selects one of 27 hues, then describes tone and saturation with terms such as ‘Fancy Light,’ ‘Fancy Intense,’ and ‘Fancy Vivid.’ The colour system GIA developed is used worldwide. Below, we see an example of one of these 27 possible hues deemed the ‘straight’ pink. 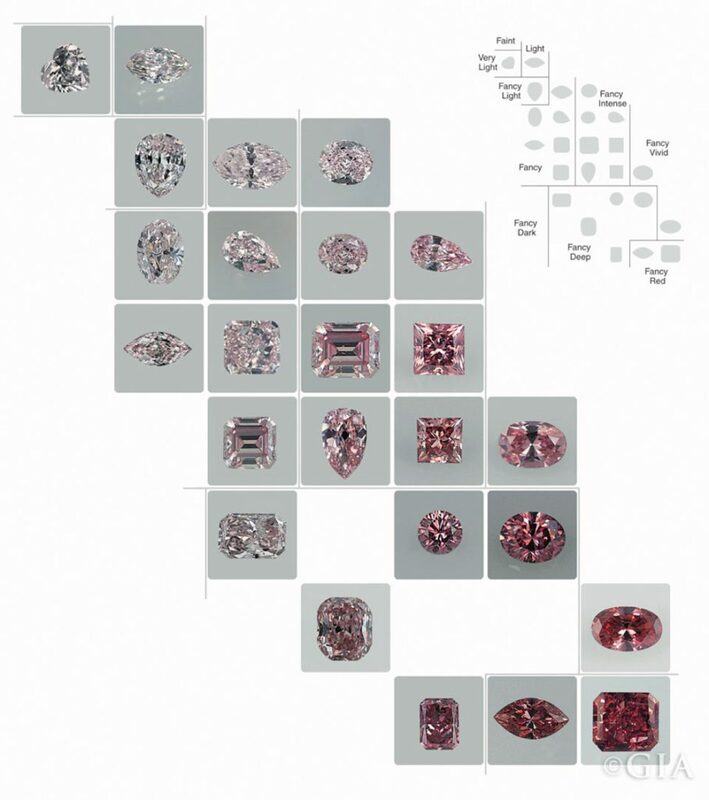 It shouldn’t come as too much of a surprise that the Argyle mine, which has managed to become the leading name in pink diamonds as a result of their brilliant branding as well as their incredible products, is responsible for creating a diamond grading system of their own. PP – Purplish Pink which is pink with a purplish secondary colour, and in rare instances Purple Pink where the pink and purple are in equal balance. The three hues are further divided into nine intensities utilising the prefix of 1 to 9; 1 being the deepest and 9 being the lightest. 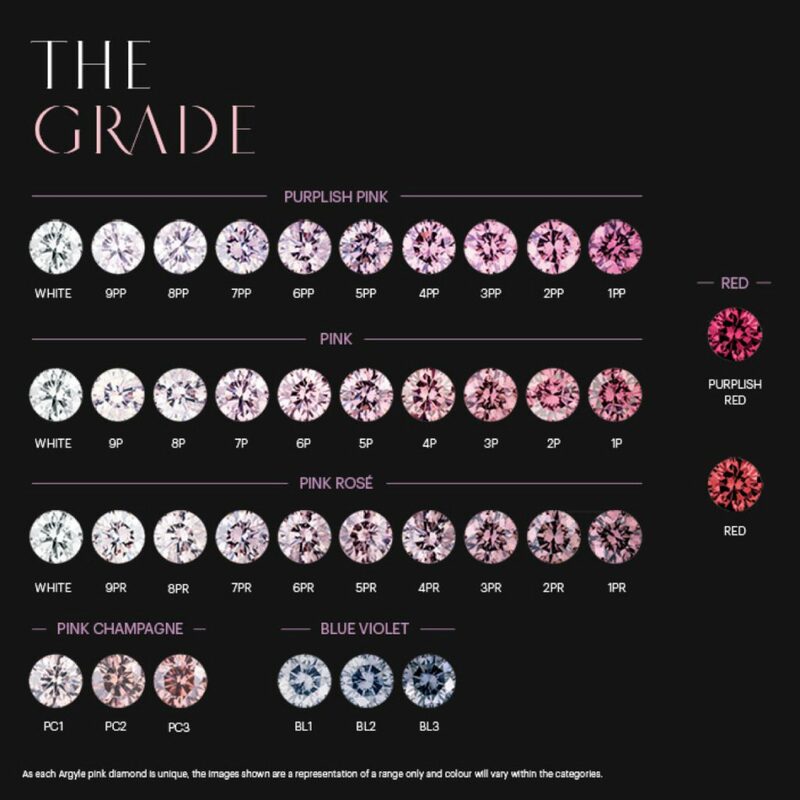 In addition to this the Pink Champagne (PC) colour profile covers those diamonds with a brown body colour and a pink secondary colour. The intensity nomenclature is reversed for this colour range, PC1 being the lightest intensity through to PC3 being the darkest. Argyle also recognises two Red hues; Red and Purplish Red, while to complete the Argyle fancy colour palette, blue-violet is captured by grades BL1 to BL3.